I usually leave the destination of our holidays up to Dave. I am quite happy to go anywhere new, and to travel as often as possible. For our first ever overseas trip where we booked an apartment, we chose to stay in Dartmouth. Being in Devon we had to try ‘cream tea’ which is a scone served with clotted cream, butter and jam. The people in Cornwall reckon their cream teas are better, and so to compare we tried them in both counties. Personally, I could not choose between the two, but I so enjoyed the clotted cream that we bought a tub of it to take with us to London. This was used as a topping for chocolate brownies which we bought at Borough Market. In the UK you can have clotted cream posted to you. With our brilliant postal system in South Africa, if the cream ever got to you it would be off. Postage can take months to get to us. I was so pleased to read this recipe in my Taste Magazine and even more pleased to realize that clotted cream is so easy to make. Now at least I don’t have to wait for our next visit to the UK to enjoy a cream tea. Is your postal system reliable? This is the ideal accompaniment to scones! Anthony’s Aunt lives in Plymouth so when we stayed there on and off for 18 months, she always had clotted cream when we visited. I like it but Anthony loves it so she was a bit of a pusher, always dolloping on more. It’s weird stuff – almost stringy and so sticky but there’s nothing like it is there? Hi Tandy, i bet this is delicious, so nice you can now make your own. Oh this is a great thing to make at home! I’ve only ever had it at high teas that I’ve gone to for a celebration. Thanks! Oh man, I’m sorry about the long postage delay… that’s so long!! This recipe looks delicious though! Sounds so good on brownies! YUM! I made a cheater’s version of clotted cream recently with mascarpone and heavy cream…but I definitely need to try this real deal version! I like that version as well Joanne, how clever! Oh, I just adore those Devonshire cream teas! Thanks so much for this easy peasy recipe, Tandy. I’ve never thought of making my own clotted cream. 🙂 The postal service in the USA is absolutely brilliant and totally reliable. What a pleasure after the awful experiences we’ve had in SA. Thank you for sharing this Tandy! Dartmouth and Devon are my number 1 destination of where I’d like to travel. I’ve read hundreds of books about this area ~ and of course read about the wonderful clotted cream. I must make this to celebrate Agatha Christie! Woohoo, can’t believe I can have clotted cream at home. We enjoyed it a few times when we visited the UK and I have dreamed about it ever since. Thanks for the wonderfully easy recipe Tandy. Oh how wonderful! I had no idea this was all there is to it! Looking forward to trying clotted cream in Cornwall and other counties this year! Thanks for the recipe, lovely lady. If you are going to Cornwall you will have great cream teas, and if you are going to Devon, they will be even better! Mmm – often thought about making this but never have – thanks for the inspiration. This brings back memories – I used to have scones with clotted cream almost every week when I lived in London – your’s looks fantastic! 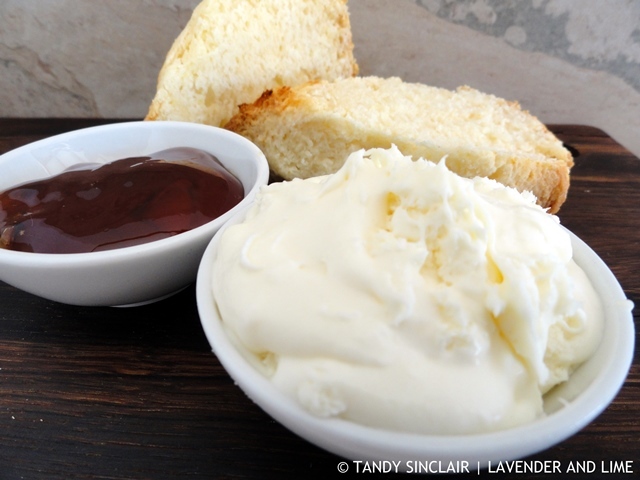 Hadn’t realsied how easy it is to make – I love clotted cream! My grandparents met in Dartmouth during the second world war – my grandmother was a Wren ferrying the sailors across the river to their boats and my grandfather was in the Royal Navy so it has a special place in my heart! I was so excited to see this recipe, and having had the real thing, this one works! Oh delicious! 🙂 Love that you got your compare on, but couldn’t decide which was better. Hmm… I think our postal system is pretty great, never lost anything or had it arrive months later. Is that South Africa as a whole or just regional parts of the country your mail takes for ever? There was a postal strike in Johannesburg only, but it has affected the entire country!